Micromax Canvas 4 Plus A315, the best smartphone in affordable price finally launched on the eve of Navratra. Now available online through infibeam priced at Rs 16,999 and priced at Rs 17,249 through eBay in white gold and black colour option. Now Micromax Canvas 4 Plus A315 will lock horn the other mid-range smartphone like Motorola Moto G (Gen 2), Sony Xperia E3, HTC Desire 616 and Desire 820. The all new Micromax Canvas 4 Plus A315 supports Dual-SIM(GSM+GSM) with Dual-Standby comes with bigger 5 inch HD Super AMOLED display with HD resolution of 1280 x 720 Pixels and special Mura Free Touch promising crystal clear display runs on most advance Android 4.4 kitkat OS most powerful a 1.7GHz octa-core MediaTek (MT6592) processor offers you superior multi-tasking experience. New Canvas Plus also comes with 1GB RAM and 16GB internal memory further expandable up to 32GB Via MicroSD card which allows you to store your favourite apps and songs. 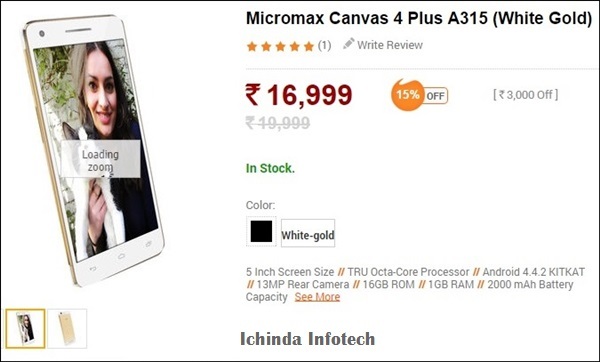 Micromax Canvas 4 Plus A315 also offers you a 13-MP Primary autofocus camera with LED flash, Face beauty mode Panorama and HDR mode and Inbuilt QR-Code scanner is perfect for photography while a 5-MP Secondary front camera with HD playback and recording and Panorama and HDR mode allows you to take selfies in spectacular fashion. Micromax Canvas 4 Plus A315 also packed with a 2000mAh battery promising talk time up to 7 hours and up to 205 hours standby time. It also offers you connectivity through , 3G, Wi-Fi, Bluetooth, GPRS/ EDGE, GPS, and Micro-USB including smart features like Smart Alert , Air Shuffle, Smart Gesture Control and Quick look. Micromax has recently launched The all new Micromax Canvas Nitro A310 octa-core smartphone priced at Rs 12,900 which supports Dual-SIM(GSM+SMG) with dual-standby, Bluetooth, Wi-fi and 3G comes with a bigger 5-inch HD (720×1280 pixel) IPS display with an oleophobic coating runs on latest Android 4.4 kitkat OS and 1.7GHz octa-core MediaTek MT6592 processor promising superior muti-tasking. Canvas Nitro also offers you 2GB RAM, 8GB internal memory which further expandable up to 32GB via MicroSD card while for shooting New Nitro combines a huge 13-MP primary camera with Sony IMX135 CMOS sensor, Largan 5P Lens, with Schott Blue Glass filter and F2.2 aperture, Rear wide angle of 28mm and a 5-MP secondary camera with BSI Fixed Focus with OV5648 Sensor and F2.4 aperture, 22m wide-angle lens with 75-degree viewing scope. It’s also packed with a powerful 2500mAh battery promising up to 10 hours of talk time, up to 320 hours of standby time, web browsing up to 5 hours(3G) and up to 10 hour 42 min* on 2G including 28 hours Music playback time. At last few honest word, Micromax Canvas 4 Plus is the best smartphone for multi-tasking. What you think? Please be open to give your view.